The following is a brief list of verdicts and settlements which the law office of SS&F has obtained on behalf of their clients. Middle-aged woman was killed on her bicycle when a truck driver violated her right-of- way, leaving her two adult daughters. A child was severely burned at a day care center. Because of the trauma of the accident the child refused to go back to day care and the mother was forced to quit her job, which led to economic hardship. Part of the settlement was used to help the family buy a house and get back on their feet. The rest was put into a trust for the child. 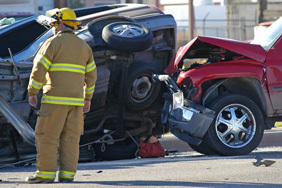 A middle-aged woman suffered a fractured shoulder in an automobile accident. Because her uninsured motorist insurance carrier failed to make a prompt and fair offer to settle her case, she was awarded $850,000 for not only her personal injuries, but for the insurance company’s “bad faith”. A father and his minor son each received $400,000 for their loss of consortium and negligent infliction of emotional distress based on severe injuries suffered by their wife/mother. The young boy suffered minor personal injuries as a pedestrian when the driver of an automobile lost control of her vehicle, striking a fence and knocking him down. Unfortunately, his mother suffered severe injuries, which the young boy witnessed, entitling him to recovery on a theory of “negligent infliction of emotion distress.” The woman’s husband also recovered damages even though he suffered no bodily injuries, on a theory of loss of consortium of the care and comfort of his wife because of her injuries. Settlement for a man injured when he slipped and fell in a Long’s Drug Store. The injury occurred when the victim was making a delivery to the store and slipped on a Christmas ornament that was on the floor. Settlement for a woman who was injured while shopping at the Ford’s Department store in downtown Santa Cruz in the 1989 earthquake. The back of the Ford’s Department store collapsed during the earthquake burying the woman under a pile of ruble. She was extricated alive but had a severe leg injury. The settlement was paid by Ford’s Department store for failing to retrofit the store in anticipation of a major earthquake in the area. Settlement for a Capitola man when his mother-in-law hired a hit man to kill him over a child custody dispute. The would-be hit man unknowingly hired an undercover officer to be his accomplice.